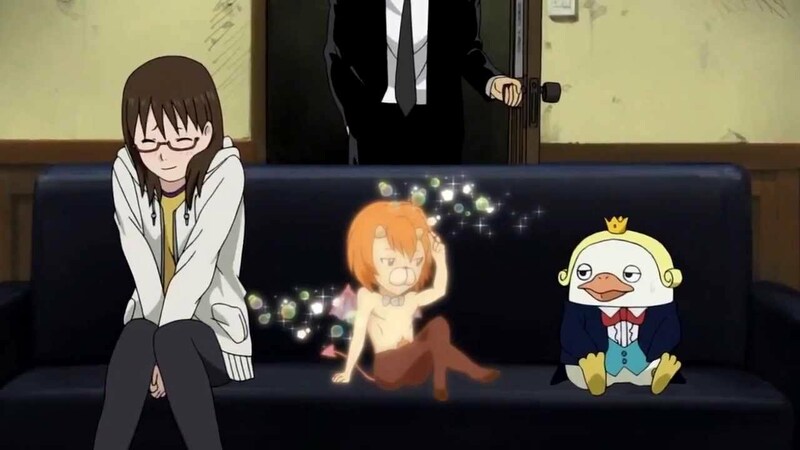 How do you stand out in the sea of comedy anime fare churned out every season? While Prison School’s animated adaptation was never going to have too much trouble making its presence felt visually thanks to its in your face presentation and premise, the answer from a broader perspective is a surprising one: Prison School refuses to outwardly present itself as a comedy at all. 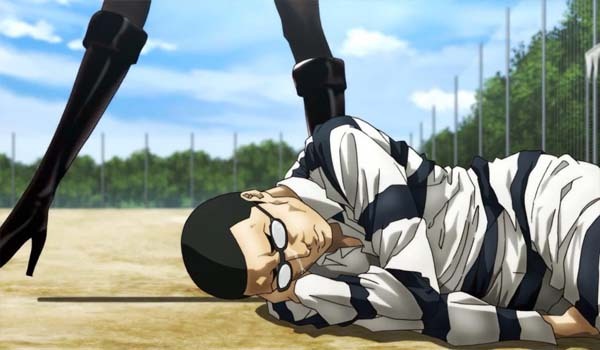 The idea of a “serious comedy” is a concept that has defined many of the high points of the career of Prison School’s director, Tsutomu Mizushima. While many fêted directors are instantly recognisable from a very specific visual or thematic style – Satoshi Kon’s fascination with dreams versus reality or Makoto Shinkai’s obsession with the distance between people, for example – Mizushima’s stand-out directorial quality is far broader; the ability to make things effortlessly entertaining in a way that feels organic and real even in the most ludicrous of situations. To that end – and in spite of the director’s assertions that it’s entirely coincidental – much of Mizushima’s work has been comedic in nature. While anime comedies often lean heavily on slapstick or allow over-the-top comedy to run riot, practically flashing “laugh here” on-screen in neon lights, there’s often a more grounded feel to the director’s work that accentuates any gags on show. It’s an ability that has served him in good stead throughout his career, allowing the charms of Squid Girl to function beyond the realms of its daft initial premise, or selling the audience on the idea of schoolgirls competing in tank battles as a path to being more ladylike in Girls und Panzer. Tsutomu Mizushima’s talent for playing sheer insanity with a straight face has seen him assigned to a number of projects that require exactly that kind of deftness of touch. Having made his debut adapting the surreal humour of Haré+Guu, he’s handled the black comedy of Bludgeoning Angel Dokuro-Chan and the sexually charged humour of You’re Being Summoned, Azazel – the latter of which served as a perfect warm-up for the director’s work on Prison School, as Mizushima himself explains. “On You’re Being Summoned, Azazel, there were cute characters to offset the more risqué jokes, but we don’t have anything like that in this piece. I wondered what I should do about it. So, I kept in mind a consideration of what the original fans would have wanted. As a result, I thought that one of the guidelines should be that jokes would not be shown as jokes. Not milking the story and dialogue and playing everything with a straight bat isn’t just a facet of Mizushima’s directorial style when it comes to comedy however – it’s also been used to great effect when exploring a genre that he clearly loves in the form of a handful of horror anime series. The director’s first project along these lines was an opportunity to resurrect the Blood franchise in the form of Blood-C, which he did by slowly weaving the characters and story into the kind of “splatter horror” he was aiming for. This was followed by Another, a horror novel adaptation which took great delight in offing its characters in a variety grotesque ways without ever batting an eyelid. Most recently, The Lost Village took a very different tact with its horror setting, with Mizushima teaming up with writer Mari Okada to create a self-aware schlocky B-movie horror experience very much in keeping with the “super-serious” presentation of Prison School. The Lost Village’s homage to B-movie horror also serves as a good example of Mizushima’s wider love of film which often rears its head in his works, Prison School included. Girls und Panzer frequently plays with concepts and stylings of war movies, while anime about anime production Shirobako isn’t just a love letter to the industry it represents but also pays homage to all manner of film through to Westerns and beyond. It’s this restrained yet clear and ever-present passion for all forms of entertainment that informs the sense of fun that pervades all of Tsutomu Mizushima’s work – watch any of his shows and it feels like the result of a group of people having fun producing a labour of love rather than a by-the-numbers affair, and that enthusiasm is highly infectious as a result, making it hard not to revel and share in the passion filtering through onto the screen. Mizushima has also proved himself a perfect pick for any series that exhibits a need to sail close to the wind (or perhaps even beyond it) with its content in the name of its entertainment value– something that the director has been more than willing to do with any project which requires it. Needless to say, this requirement also came to the fore during Prison School’s production. Perhaps none of this is enough to place Mizushima into the hall of all-time great anime directors, but surely few can boast the consistency of quality to his output over recent years, and in terms of sheer entertainment he certainly has few peers at present. In terms of all of the qualities which he brings to the table, there is no example better than Prison School at exhibiting the considered, wonderfully crafted sense of fun that all of his works exude. Prison School is released in the UK by Funimation.